A teacher has been praised for helping take care of a student’s baby in class, because he couldn’t get a babysitter. 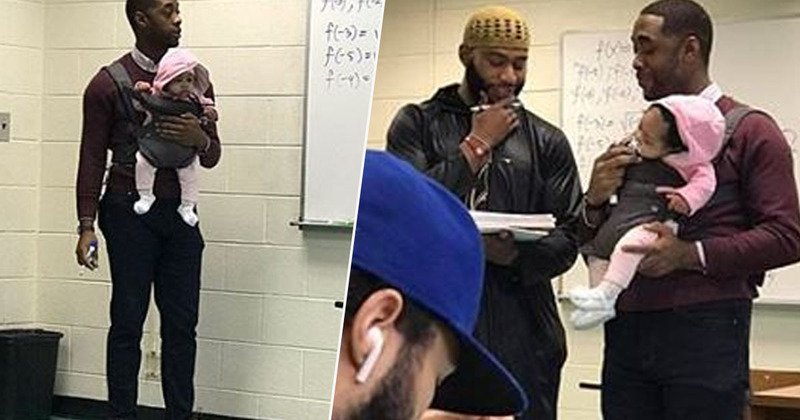 Professor Nathan Alexander was giving a math lecture at Morehouse College in Atlanta, Georgia, yesterday (March 1), when one of his students arrived with a new little addition to the class. 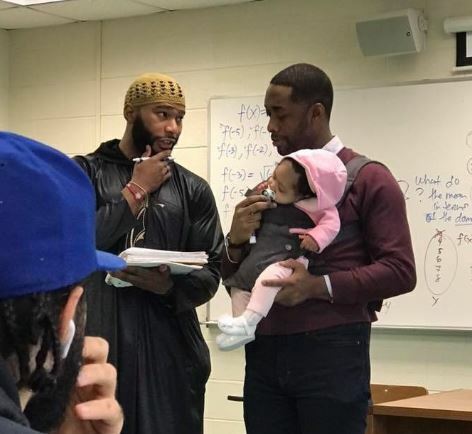 The student hadn’t been able to find a babysitter to look after his little girl but obviously didn’t want to skip his lecture, and so he decided to bring the baby with him to school. Luckily Alexander was more than happy to welcome another bright mind into his class, and he even offered to lend a helping hand with the child so her father wouldn’t miss out on any important note-taking. Another student, Nick Vaughn, shared a cute picture of the scene on Twitter, explaining what happened. Alexander strapped the baby to his chest and carried on with the class as usual, keeping a comforting hand on the child while talking the class through some complicated-looking equations. Vaughn explained in a post how not only did the teacher look after the child for the whole lecture, but he carried on holding her after class while he helped those with questions. The professor received a lot of love on social media after Vaughn posted the picture, being shared 15,000 times and racking up 64,000 likes at the time of writing. One of the math teacher’s other students responded to the tweet with their own praise, emphasising his good deed for the babysitter-less student wasn’t a one off. @professornaite is one of my favorite professors!! Genuinely cares for the students and sacrifices his personal time always to help in any way possible. nothing but respect. I think we all need someone like Alexander in our lives!